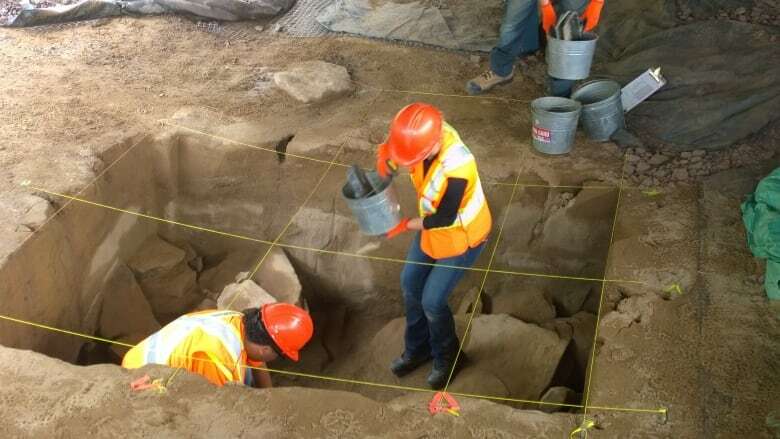 Archaeologists say a campsite unearthed just metres from a highway in Fredericton could be more than 12,000 years old. Archaeologists say a campsite unearthed just metres from a new highway in Fredericton could be more than 12,000 years old. The campsite held 600 artifacts, most of which were from tool making, as well as a fire pit containing ancient charcoal. Artifacts including stone tool fragments and arrowheads that would have been attached to rods to make spears have been found at the site. No ceremonial objects were found at the site. The campsite is located just metres from the shoulder of a stretch of Route 8. Around 600 artifacts have been uncovered at the dig site near Route 8. Most of them include fragments of stone that came from making stone tools. (Shane Fowler/CBC)Suttie estimated the site to be between 11,600 and 12,200 years old. The site appears to be located on what would have been a beach on a shoreline, which was determined by using predictive measures. "This would have been the shore of a former glacier lake," said Suttie. "The other shore would have been around where Dundonald Street is. Up north, the lake would have went to Currie Mountain and south all the way to Belleisle. It was a big lake." The lake would have been about 10 times the size of Grand Lake, which is the province's largest lake. Some people working at the dig site have a personal connection to the artifacts they're digging up. Shawna Goodall, a technician working on the dig site, is Maliseet with a long family history in New Brunswick. 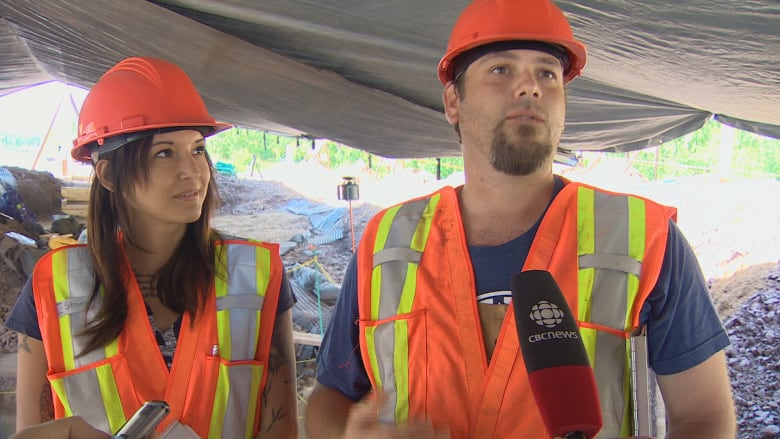 Shawna Goodall and Tyson Wood are two of the Maliseet technicians working on site digging up the past of their ancestors. (CBC)"It's such an amazing feeling to have that connection," said Goodall. "These are my ancestors. And just to be able to be the first one to hold things in 13,000 years — I get goosebumps every time." Tyson Wood, also Maliseet, grew up at St. Mary's First Nation just a few kilometres from the site. "Just to stand here, and to see that hearth, and to know that 12,000 years ago that our ancestors were sitting around a fire here, manufacturing their tools — you can see the goosebumps on me. I feel that connection." Suttie said the site and artifacts are "within 500 years of the oldest evidence we have of people being in the area." Transportation Minister Bill Fraser visited the dig site and called the site "significant." "This is very important to the people of New Brunswick," said Fraser. "And we will see that it is protected."